Former chairman of the Tobago Division of the TT Camber of Industry and Commerce, Demi John Cruickshank. WITH Christmas fast approaching and the continued challenges on the seabridge, former head of the Tobago Division of the TT Camber of Industry and Commerce, Demi John Cruickshank, is calling for an immediate fix to the daily woes faced by commuters. Cruickshank told Newsday on Saturday, the tourism sector is the one mainly affected by the frequent breakdowns on the inter-island route. He called on the government to hasten their plans to lease an additional fast ferry to assist with the load in the absence of the TT Express. The TT Spirit, the lone fast fer­ry on the seabridge, was pulled from sailing last week Tuesday for re­pairs, after a cracked crankcase was reported. On Wednesday, the Galleons Passage, which was on its way to Tobago, turned around mid-voyage with NIDCO citing “severe weather conditions” as the reason. It resumed sailing the day after. 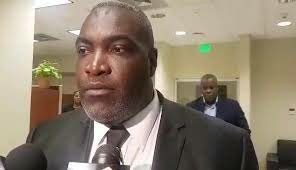 In a Facebook post last week Wednesday in­cor­po­ra­tor of the new­ly-formed Tobago Business Chamber, Martin George, described the con­tin­u­ing disruptions on the inter-island route as “un­accept­able”. “The To­ba­go Busi­ness Cham­ber con­demns the con­tin­ued and col­lec­tive­ly abysmal fail­ure of the Gov­ern­ment, the board of the Port Au­thor­i­ty and NID­CO in their com­pre­hen­sive fail­ings and incompetencies in mis­man­ag­ing the seabridge, which re­mains a life­line of ne­ces­si­ty for the cit­i­zens of Trinidad and To­ba­go, and even more so for the av­er­age To­bag­on­ian. Reply to "Cruickshank: Seabridge woes hurting Tobago’s tourism"